The waiting area, with a color palette of neutrals with green and brown accents, features soft leather seating and images of Yosemite National Park. 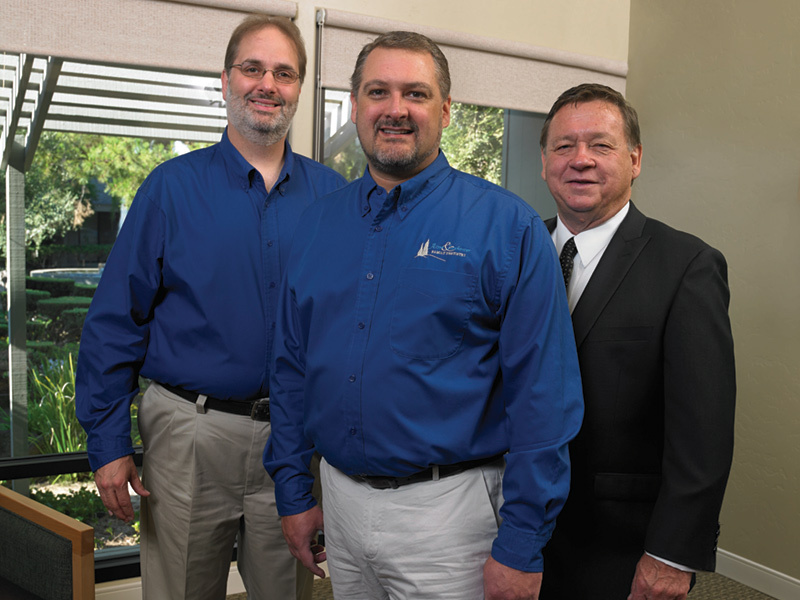 In Modesto, California, a largely agricultural area with a strong presence from Gallo Winery, Dr. Corey Acree purchased a general-dentistry practice from a retiring dentist in 2002. After 10 years, revenues nearly doubled. Then a new associate, Dr. Kevin Isenhower joined the practice providing additional services such as wire-free orthodontics and new bonding techniques that complemented the existing treatment options already provided by the practice. As Dr. Acree experienced this amazing growth, the office layout became an obstacle to providing superior patient care and to continuing the expansion of services and technology. At just 1876 square feet and 6 operatories, the office could no longer accommodate two doctors, staff, and the ever-growing patient load. 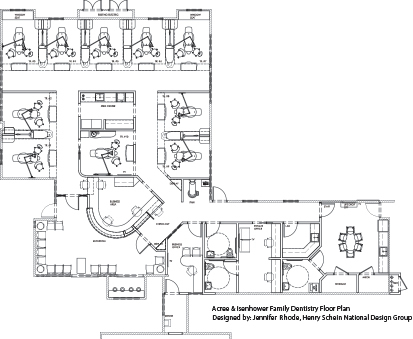 As is the case in many older dental offices, the sterilization center was too small, poorly laid out, and inefficient. The front desk area was cramped. Overall patient flow was a problem: there was limited access for those with disabilities, and the sole entrance to the surgical operatory was through the staff lunchroom! 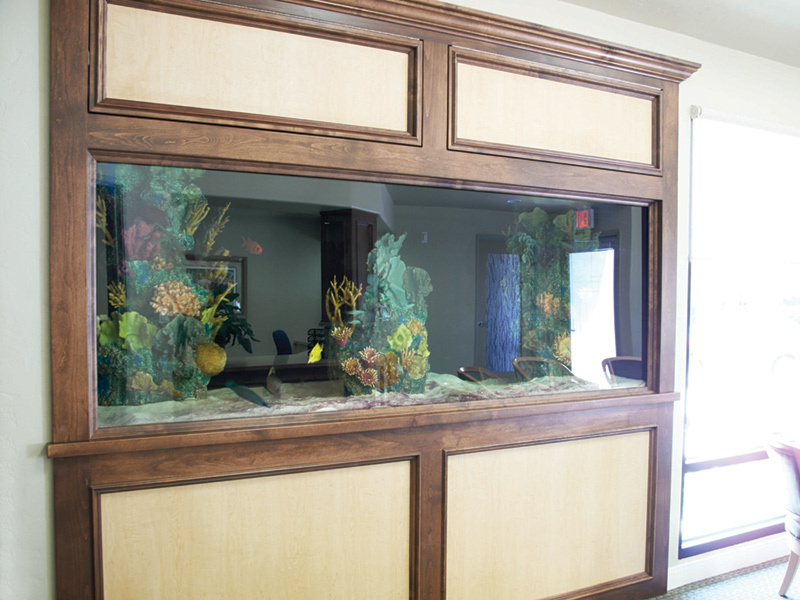 A beautiful 540-gallon saltwater fish tank welcomes patients and makes them feel at home. When Dr. Acree—already a longtime Henry Schein customer—began to consider building his own office, he was introduced to Equipment Sales Specialist John Pacelli, who invited the doctor and his wife, Bonnie, to attend the “Driven to Excellence” course in Oregon. 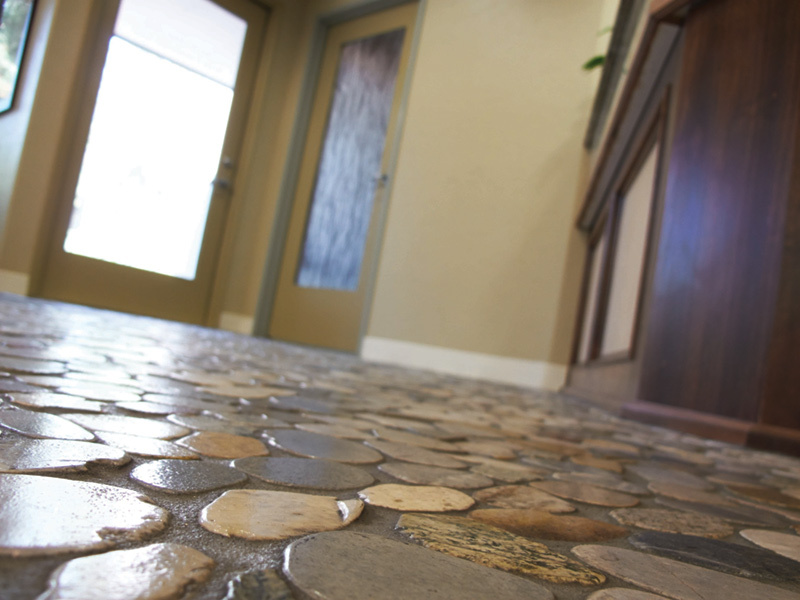 River rock mosaic flooring complements the front-desk area, adding to the rustic, comfortable feel of the office. So, when a larger space became available for purchase right in Dr. Acree’s complex, Downey Park Professional Center, he made his decision. Not only was Downey Park set on a beautifully landscaped, park-like piece of property and considered one of the most desirable professional locations in Modesto, but he also knew the transition for patients and staff would be easy: the office would remain essentially in the same place. 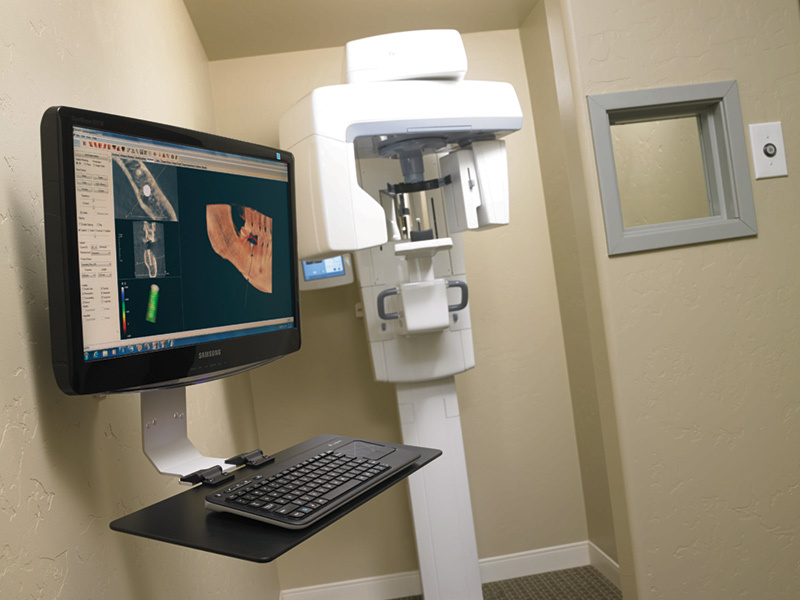 “With our 3-D imaging, digital X-rays, and intraoral cameras, we can provide better patient diagnosis and excellent patient education,” explains Dr. Acree. The staff loves the Pelton & Crane Solaris Sterilization Center, complete with a Vista Pure Water System, Miele Thermal Disinfector, and Bravo sterilizers. After viewing equipment for the new office at the Driven to Excellence seminar, Dr. Acree immediately purchased several pieces of technology and began using them before he moved to the new location. He invested in the Instrumentarium OP300 Panoramic and 3D Cone Beam Imaging System to enhance his implant services and three SOPROLIFE imaging devices for caries detection. The office design was completed by Justin Crooke of Henry Schein’s National Design Group, but when the construction crew opened up the walls, what they found was not what anyone expected. The building’s plans did not match the reality of what was there. Although the delay was unexpected, the rest of the build was completed on schedule so the doctors and their staff could move into the new office in August 2012. 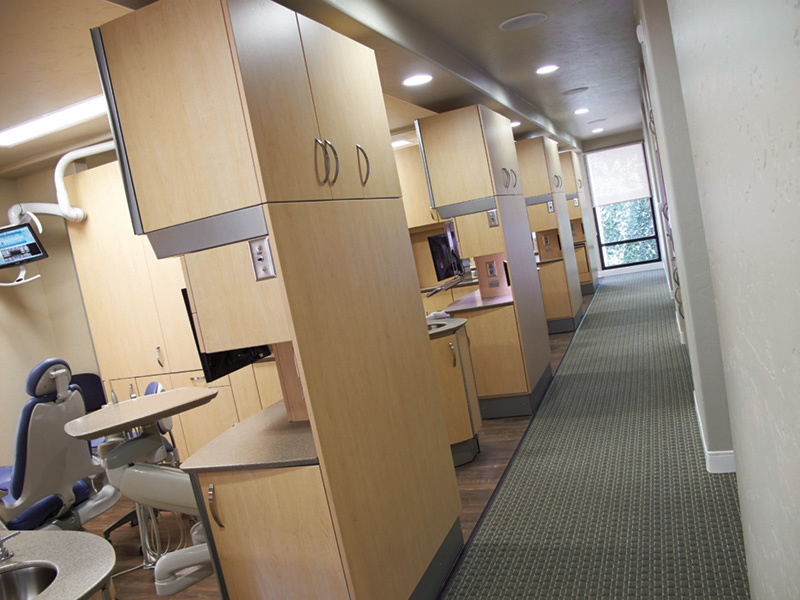 With 10 operatories in 3,400 square feet, the new office is more spacious and enjoys a more efficient patient flow. The new office nearly doubled in size from the old space, with 10 operatories in 3,400 square feet, allowing plenty of room for the two doctors, three assistants, and five hygienists that make up the dental team. 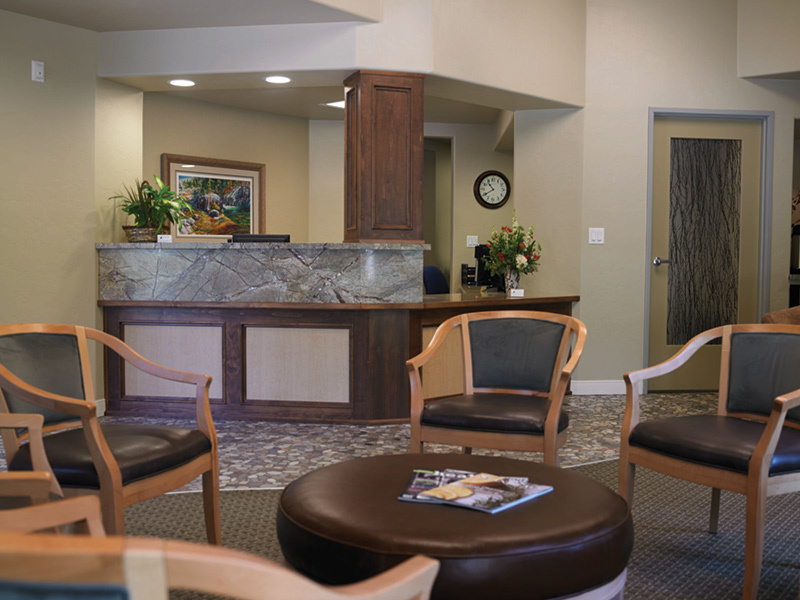 When patients come into the office, they are met with nicely arranged, comfortable seating in soft leather and fabric, and a spectacular 540-gallon saltwater fish tank. The color palette is a calming selection of neutrals with green and brown accents. River rock mosaic flooring and carpet lead through the reception area to durable, wood-like vinyl in the operatories. Walls are filled with images of Yosemite National Park from a local artist, and an abundance of windows allow patients to drink in the gorgeous landscaping and the water feature outside. Wider hallways and doorways accommodate people with disabilities. The Vista Pure Water system provides the finest quality water for patient safety and practice convenience. The doctor had Pelton & Crane operatory furniture in his previous office and liked it. For the new space, he chose Renaissance cabinetry. Luxurious Spirit patient chairs and delivery systems add comfort and convenience. 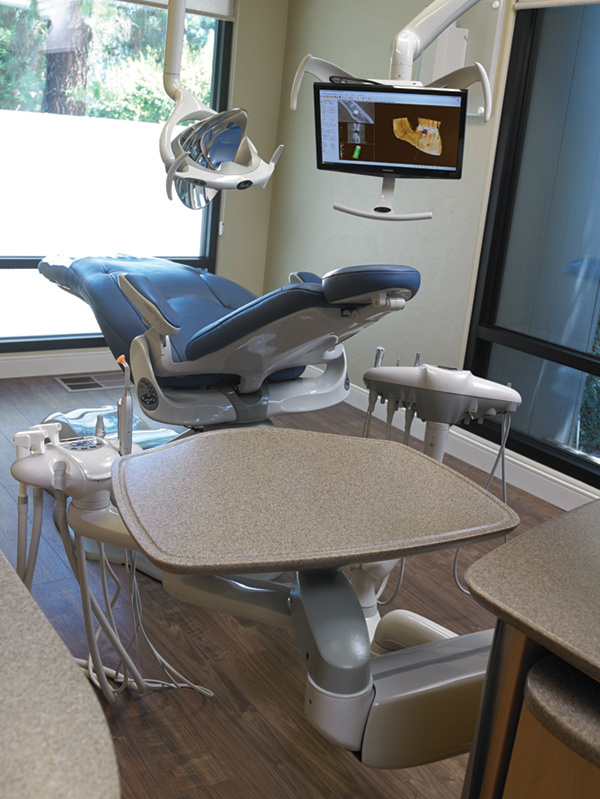 Operatories are spacious and equipped with plumbed-in nitrous oxide from Accutron, Helios lights, and patient monitors that display patient education and patient entertainment, digital X-rays taken with DEXIS digital sensors, intraoral camera images, and treatment information. The Instrumentarium OP300 enhances the practice’s implant services. 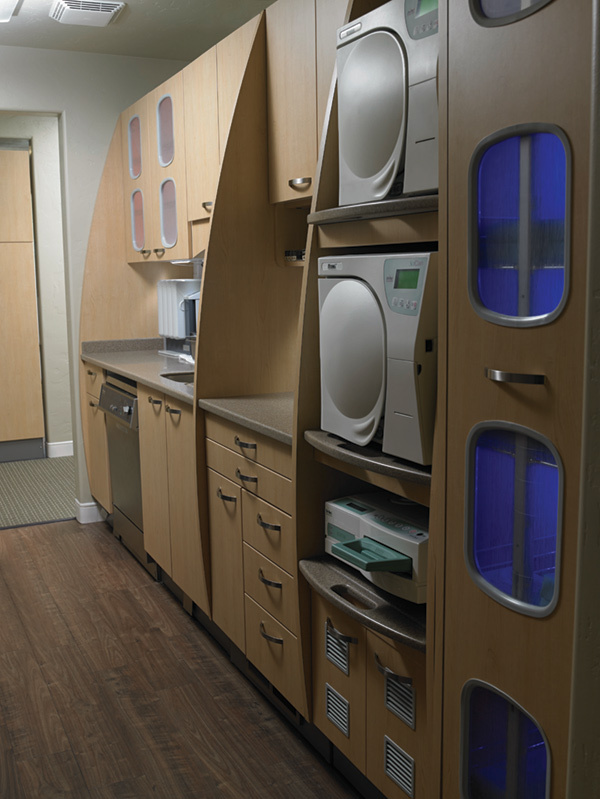 The new Pelton & Crane Solaris Sterilization Center, complete with the Vista Pure Water System, provides superior cleaning and safety for the staff and the patients more quickly than the old sterilization setup; it has the potential to save a typical dental staff up to two hours a day! Additionally, the Cubex System, with its automated dispensing and order-tracking capabilities, provides easy and foolproof supply management. 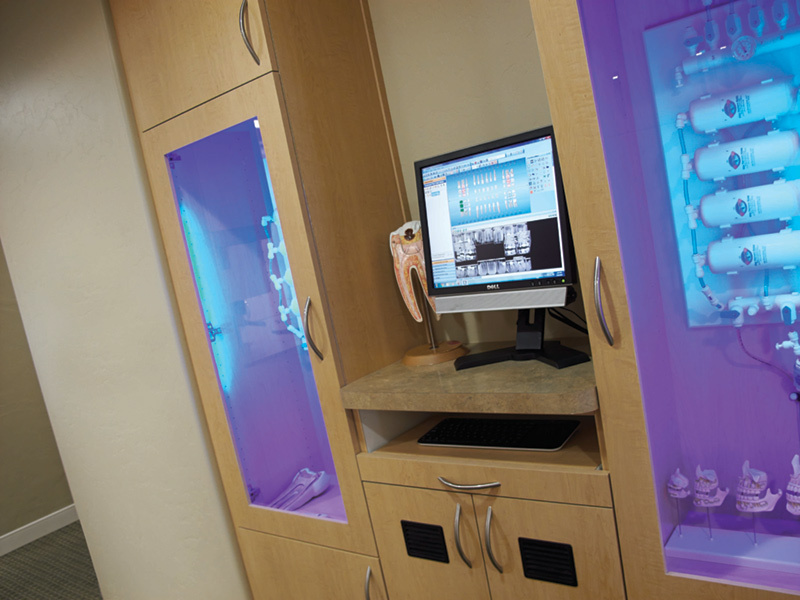 Dr. Acree and Dr. Isenhower use Dentrix software, making the office fully digitized and chartless. They also find that Demandforce software is a powerful tool for both patient communication and marketing.